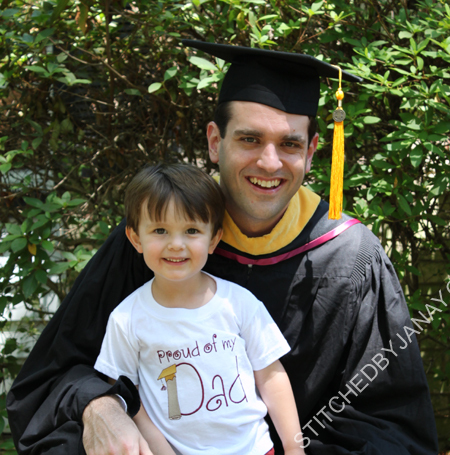 Today my husband graduated from Florida State University with his master's degree. We are immensely proud of his hard work and success in school while working full time as the sole provider of our family. He's amazing and awesome and I love him very much! So you know me... 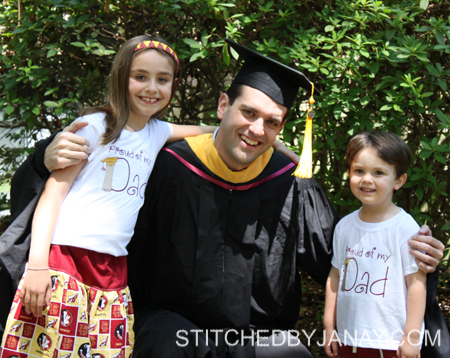 I just had to make the kids something special to wear for graduation! 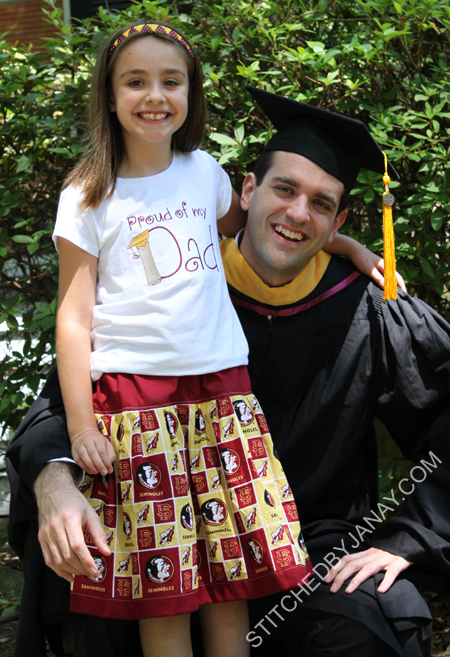 I've had this FSU fabric in my stash for a long time (picked it up as a remnant) and it was the *perfect* amount to make a skirt for Annaliese! 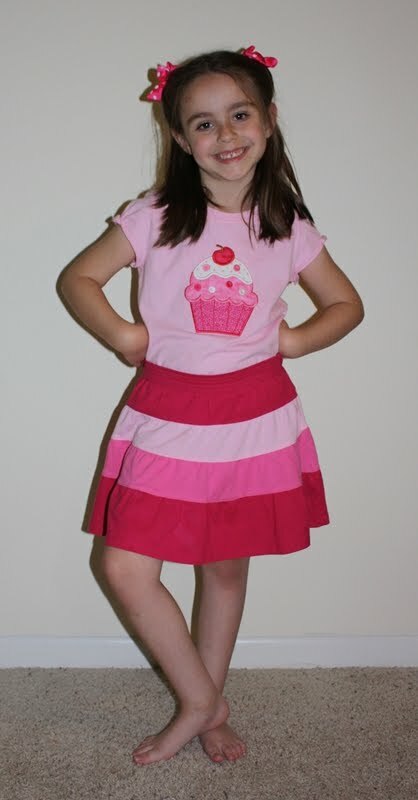 I followed the tutorial for a Girly Twirly Skirt posted on Just Deanna. It's a decent length, so she should get some good wear out of it. We are all thrilled that this chapter in our life is over, and anxious to see what God has in store for us next! 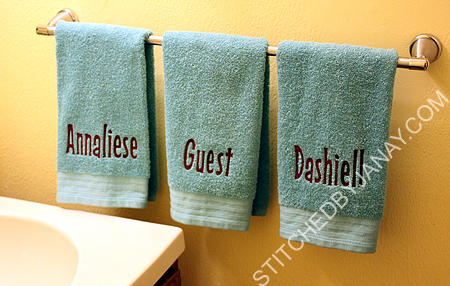 Sometimes I get really irritated with myself for giving my kids such LONG names. 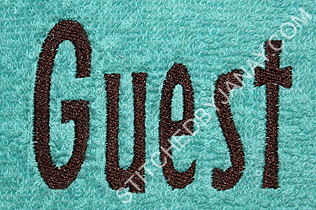 It took me quite a while to pick the perfect font -- a nice bold fill stitch for towels, 2" tall, yet not so wide that it wouldn't fit on a towel. 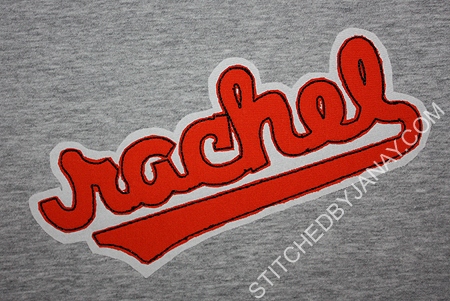 AND I wanted something gender neutral in a font that my three year old can read. One Pice from 8 Claws and a Paw was perfect! Brittany got a good deal on these two items (one from Zulily, one from a consignment sale) and she asked me to monogram them. And finally a few key chains for Ginny to give as gifts. 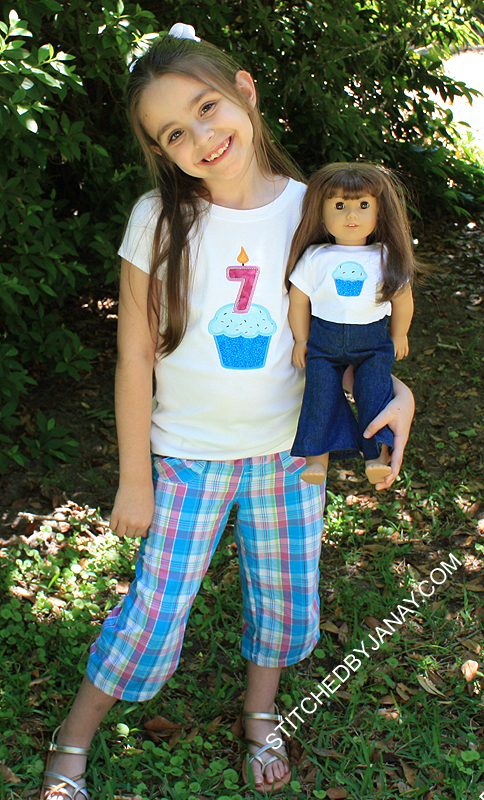 I used Embird Alphabet #7 for these. Ok, back to the kitchen! 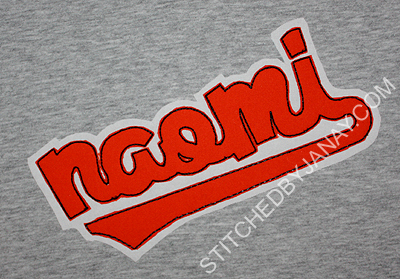 Frayed or raggy designs are such a nice quick way to put a big design on such a tiny item. Only 4 minutes on my machine, all trimming done afterwards when it's out of the hoop. 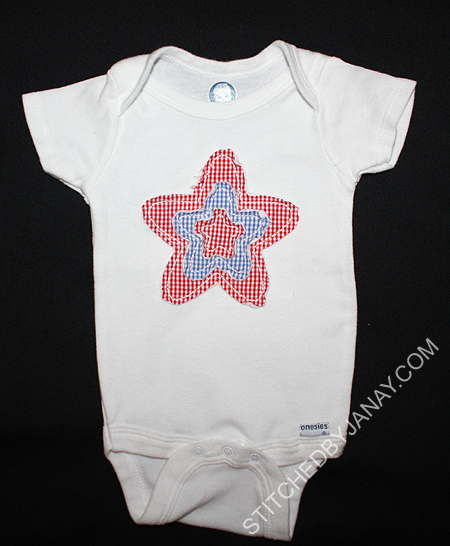 Now that's my kind of onesie design! 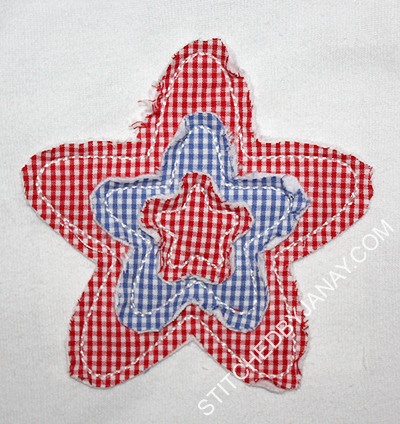 I've done a three layered frayed star design before, but I really like the look of this rounded version! My dear friends Jason and Anna contacted me about making a gift set for our mutual friends that were expecting a baby girl. They were keeping her name a secret until birth, so we had to be a touch more creative. 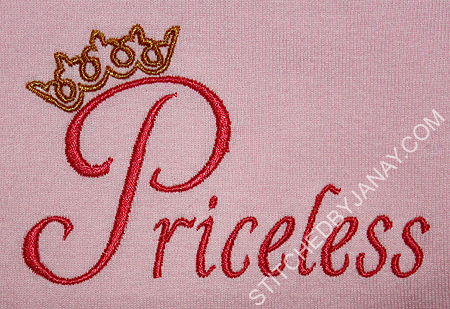 Jason really wanted to incorporate their last name, Price, into a gift in a clever way. 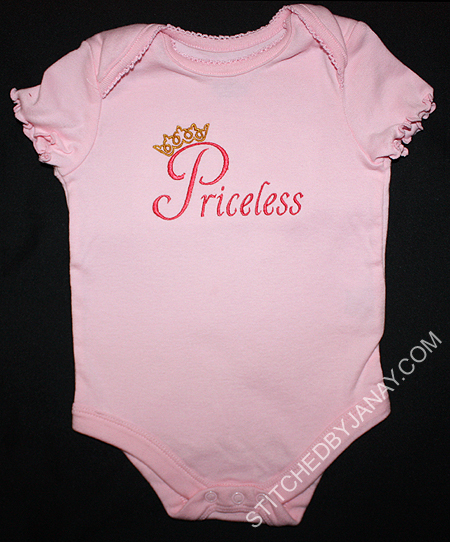 We settled on "Priceless", isn't that perfect for a little girl?!? I used the Sherry font from 8 Claws and a Paw, and added a crown that I plucked off of another design... no record of that one though! 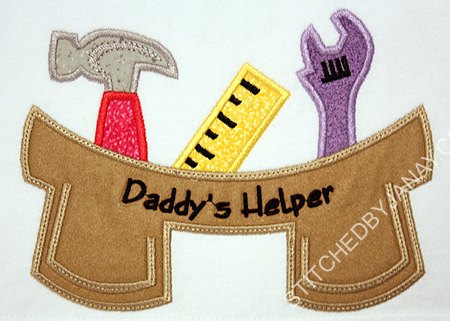 This adorable tool belt applique design from DigiStitches. 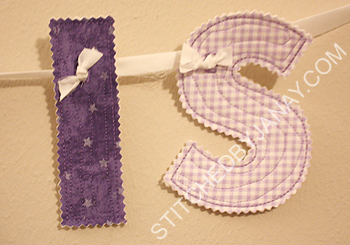 I used a brown suede-like material for the belt, and added "Daddy's Helper" with Embird Alphabet #14. 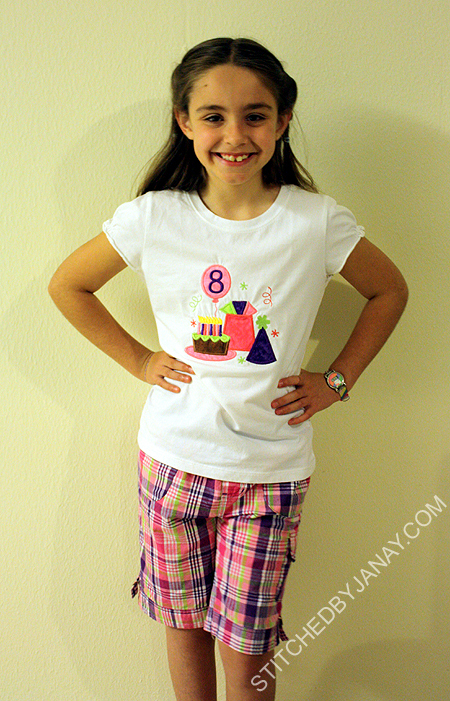 Today my little girl is EIGHT! I can't even believe it! 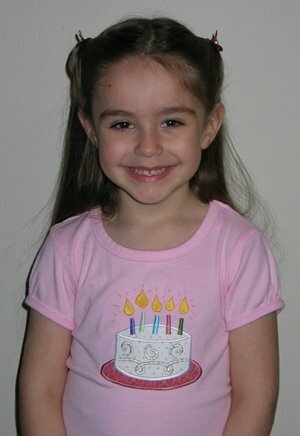 Happy Birthday Annaliese! 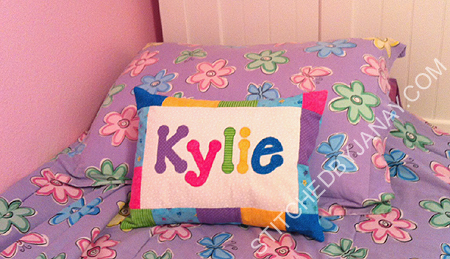 Kylie already has her name on her bedroom wall with wooden letters in the Tinker Toy font, so I selected the Dotty Applique Alphabet from Embroidery Boutique, using the zigzag finish for the quick stitch. All five letters fit in my 10" hoop perfectly! By the time I added a 2" pieced border around the center panel, I ended up with a 12x16" rectangle so I could use a pillow form instead of stuffing my own. Yay! 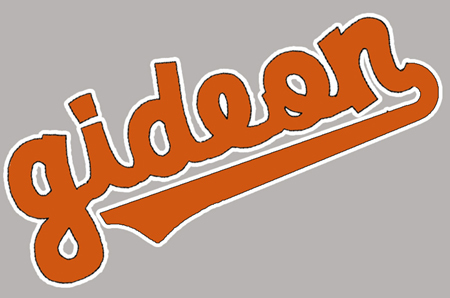 I have friends that are huge Orioles fans and celebrate opening day of baseball season like it's a holiday. 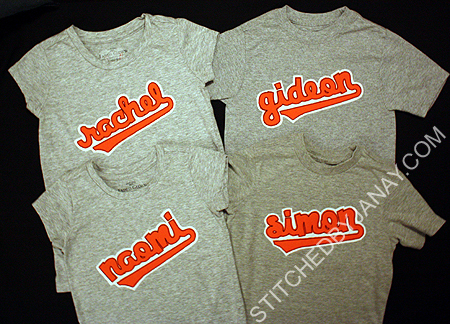 :) Three of the past four years (2008, 2009, 2010) I made special shirts for the kids to wear. 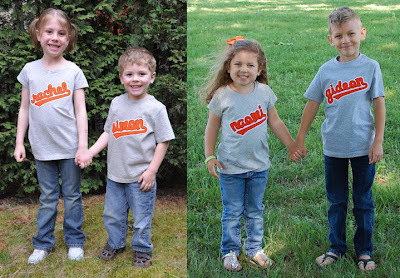 Last year they were ready for a new look -- the kids were outgrowing that monogram. 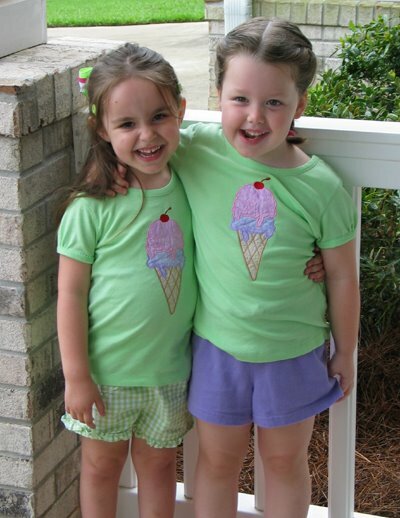 Kelli and Daisha found a screenprint tee online that they liked, and asked if I could recreate the look. The reality was that I couldn't recreate it at the same price, so I bowed out. Disappointed... but their shirts were really cool! 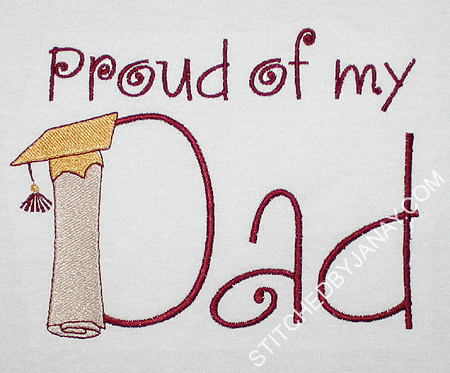 However, when I posted Dashiell's applique script name shirt in January I figured I might have gotten my job back. 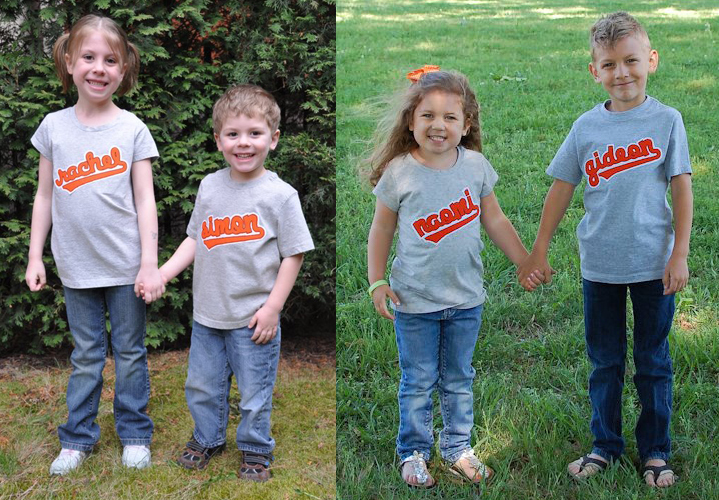 ;) After lots of brainstorming and emails back and forth, here are the kids ready for baseball season 2012! 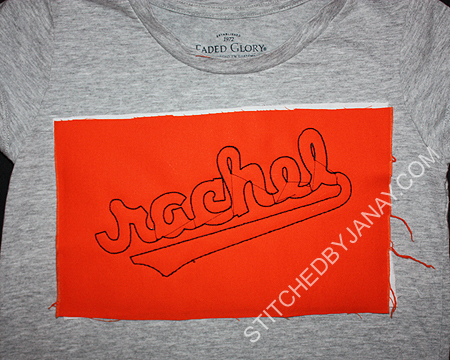 So I had two things to figure out -- how to outline it in white, and how to add the underline. 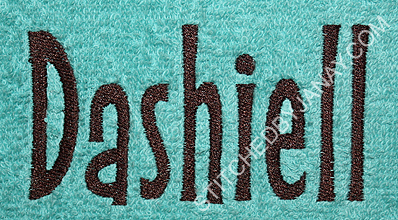 Since the alphabet is digitized with a triple bean stitch, I figured I could relatively easily digitize my own underline for the names (which I did, woo-hoo!). 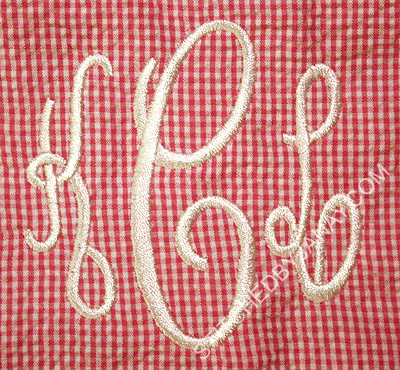 But I am not Embird Studio savvy enough to figure out how to add an echo satin stitch to something that already exists. 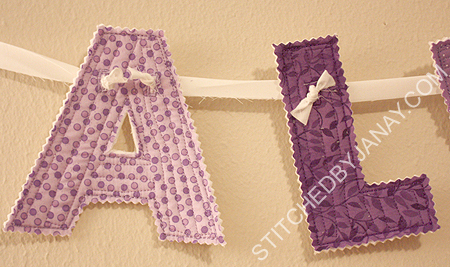 So instead I suggested using the next best thing -- fabric! This technique went pretty fast at the machine. I got the shirt hooped. 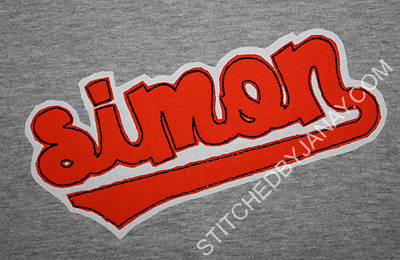 I put Heat-n-Bond Lite on a layer of white fabric and a layer of orange fabric. I cut them larger than my hoop to be sure it was big enough for the whole design so I could skip the placement stitches (saves time!!). 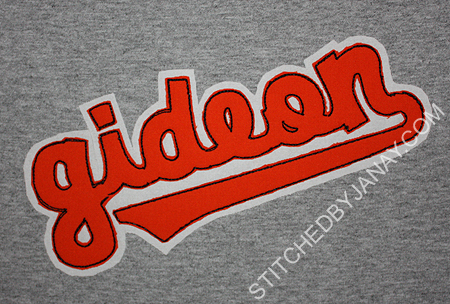 I laid down the two layers of fabric and stitched the triple bean stitch design and was done doing the embroidery! 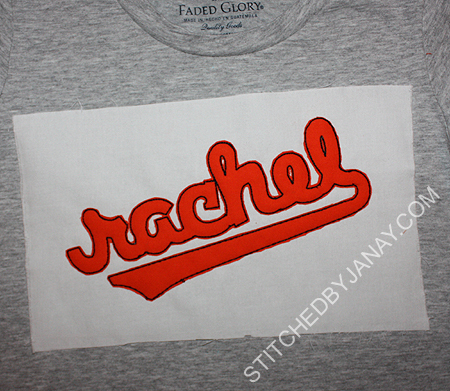 Next I trimmed away the white leaving about a 1/4" echo patch around it. 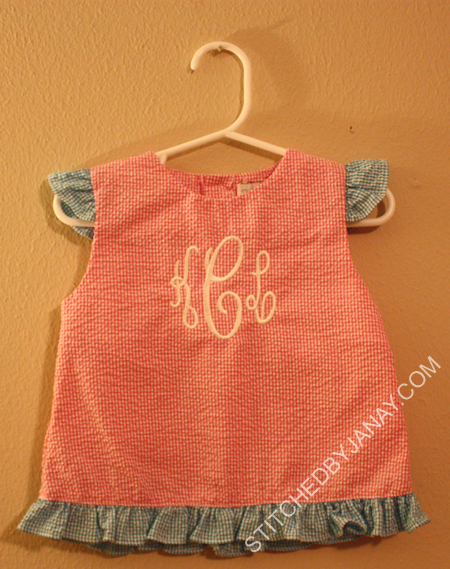 And then I pressed it really well to get the HNBL to adhere the fabric to the shirt. 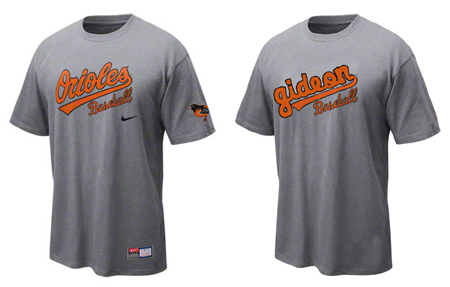 The one final detail that was added to each shirt: A baseball on the back of the shirt near the neckline. 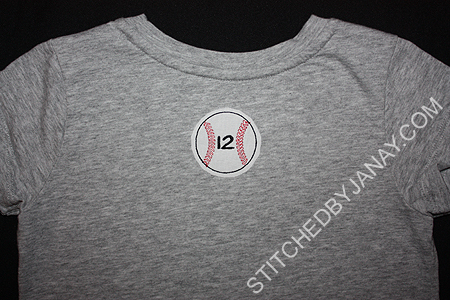 The "12" commemorates the year. 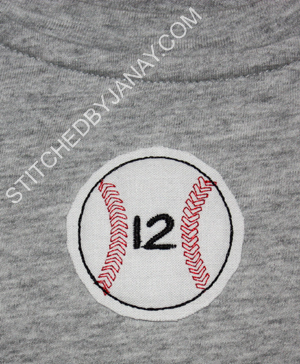 I used an applique baseball but deleted the satin stitch step and instead stitched the tackdown line a couple more times. I use Embird Alphabet #14 for the 12. 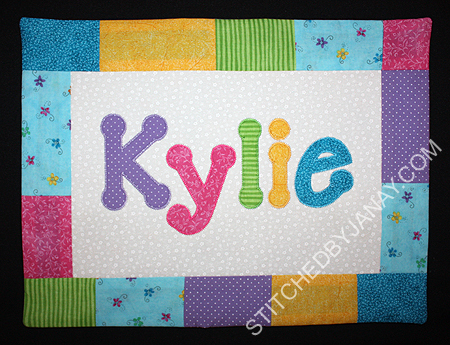 This was such a fun project! I always enjoy working on things for the Sheets clan -- they keep me on my toes and I'm always growing. It's awesome. 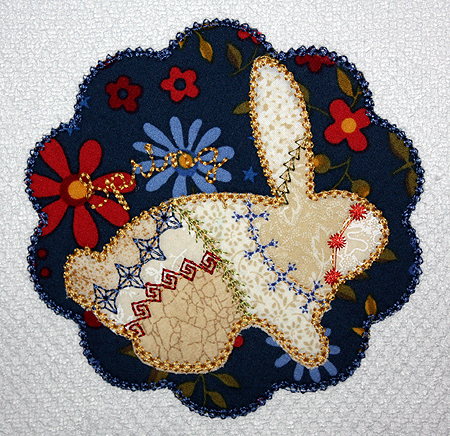 Applique Forum initiated a monthly challenge in March, which I participated in. We were each given Hang To Dry's Vintage Luxe Bunny in Scallop design and asked to think outside the box and stretch ourselves -- use a fun type of fabric or embellishment, manipulate the design somehow... the possibilities were wide open, how fun! At the same time that this challenge began, I was in the midst of three big custom orders (which I still haven't been able to share yet...but soon!) so my creative juices were TAPPED DRY. 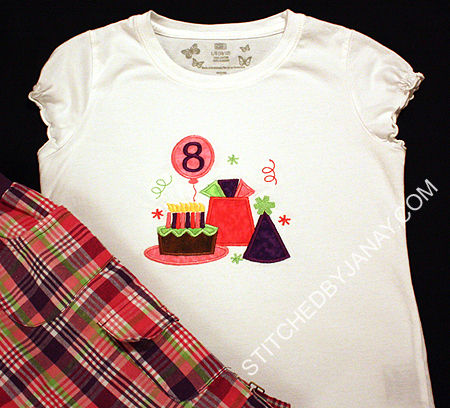 I finally decided that I would put the bunny on a shirt for Annaliese and let her pick all of the fabrics and threads, that would be completely out of my comfort zone, HA! But alas, even though it's a lovely design, it wasn't a style she was interested in and she declined my offer. 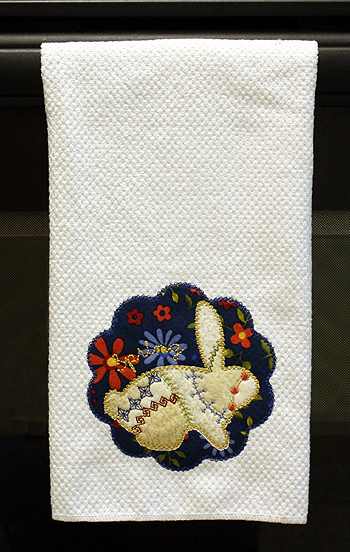 The clock was ticking... She did end up helping me out by giving me a suggestion -- she reminded me that I didn't have any Easter towels for my kitchen, so my "outside of the box" angle was a non-springtime color theme! The neatest part in participating in a challenge is seeing what other people do with the exact same design. About 70 people participated and no two were alike! 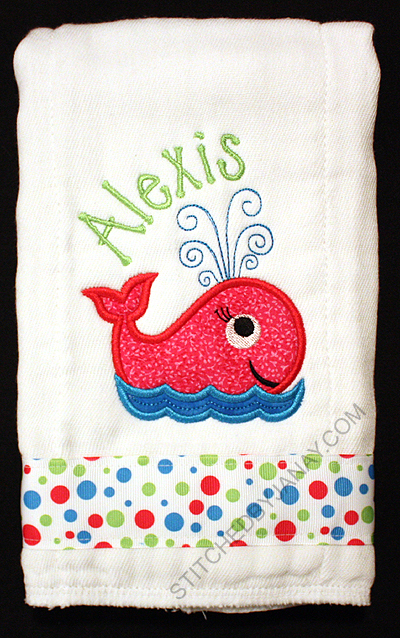 Sunday we had a baby shower at church and I stitched a few items for baby Alexis. 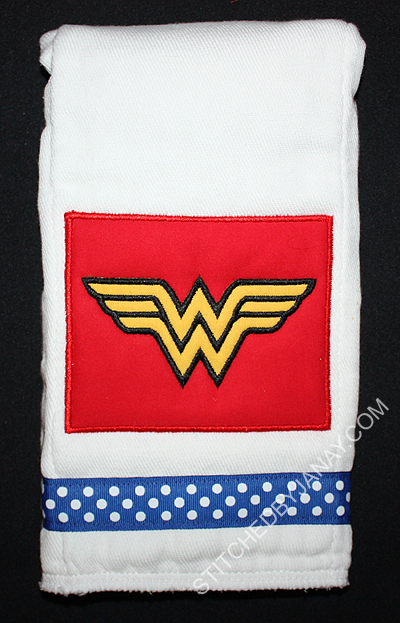 Michelle requested a burp cloth. 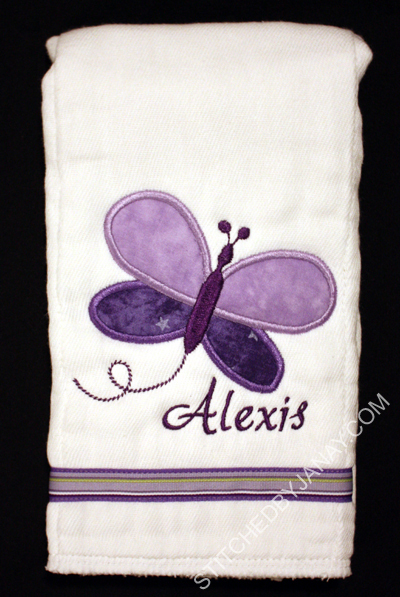 We looked over the registries and saw lots of purples and butterflies, so I used Lynnie Pinnie's Applique Patriotic Butterfly (minus the stars) and (appropriately) the Alexis font from 8 Claws and a Paw to add her name. My gift was one of those rare opportunities where procrastination really paid off. :) Friday morning I still hadn't decided what I was going to do, and I woke up with a cute swirly girly whale in my inbox to test for Lynnie Pinnie. Woo-hoo! 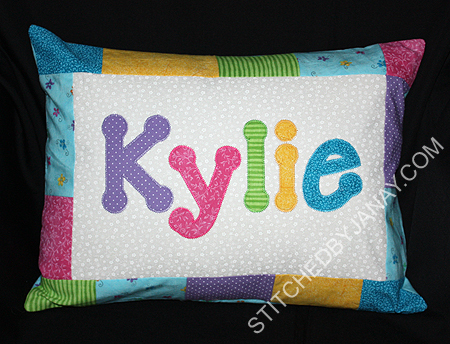 I picked this polka dot ribbon for the colors, and Itty Bitty from 8CP for her name. Remember that cute owl I tested for Sheila last month? Well Friday afternoon she posted this cute little bear requesting a tester. 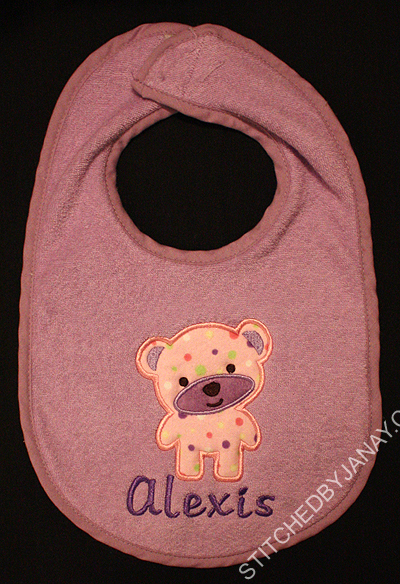 Again procrastination paid off and I used it that night for this bib! 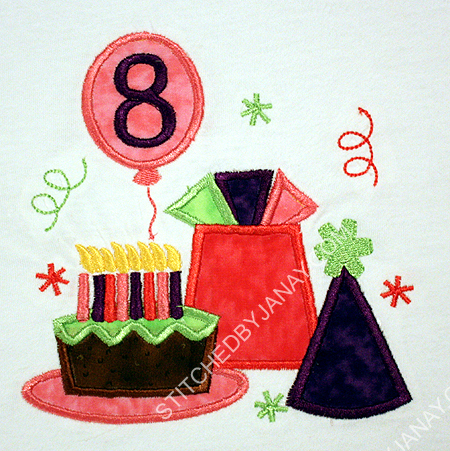 (Sheila is not selling her designs yet, but you can follow her on facebook: Savvy Stitches Applique.) I used 8CP's Dorthy to add her name.